The smaller the community the greater the spirit. That was the one defining picture that came shining through in the strongest possible way when I had the privilege of been an invited speaker at the St Marys Asdee GAA clubs dinner in the Listowel Arms Hotel on January 29th. Asdee one of the smallest clubs in the county were celebrating their Kerry County Novice Shield victory. This win might appear to be of little significance to the bigger, more dominant clubs in the higher divisions of the Kerry league but the massive impact it has had on the Asdee community is something very special and uplifting. The club or parish team has been the foundation on which the organisation was built. The wonder of the GAA for well over a century has been the manner in which small communities and people of humble backgrounds have become house hold names all over the country and beyond. And little Asdee is the outstanding typical shinning example of exactly this. And the county should be very proud of them. Small rural parishes such as Asdee and many more scattered throughout the Kingdom have taken on the mammoth task of keeping the GAA alive and the sheer pride, dedication and down to earth preservation of the true ethos of the association is there for all outsiders to see. Small can not only be beautiful but successful. And Asdee have been highly successful on the field of play with Kerry. 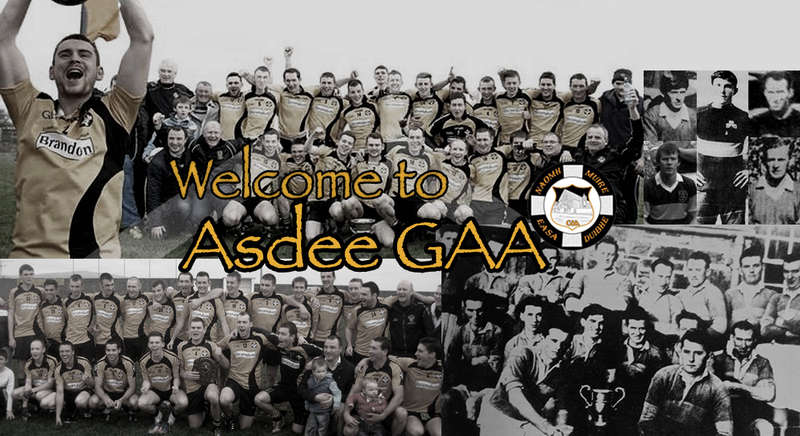 The club can boast of having the remarkable total of thirteen All Ireland Senior Football medals in the catchment are of Asdee which stretches a six mile radius with one of the largest parishes in the county Ballydonoghue at one side and the Shannon River at the other. So that will give you an idea that football was always very much alive in the locality. “Long” Jack Walsh, won six All Ireland medals and he made twenty one championship appearances for Kerry, his career lasted from 1928=1943 The brothers Paud and Eamon O Donoghue, two senior medals each. Marvelous servants of Kerry the brothers both now sadly departed between them played an astonishing one hundred and eighty two times for Kerry in league and championship. Their careers ran from 1964 to 1974. Eamon scored 5-53 from his favorite wing forward position in a glittering career. I was delighted to meet a daughter of Paud’s at the event two weeks ago. That was achieved following an extra time defeat of Clounmacon, Renard were overcome at the semi final stage but probably the victory that will live longest in the memory of everybody associated with Asdee football was certainly the winning of the County title but the manner in doing so and defeating near neighbors and fellow parishioners Ballylongford made it that bit extra special. In fact the majority of these players had played underage football together and on the day served up a pulsating game which captured the hearts and minds of this little community. This then is what the grass roots is all about, what community means and all for one and one for all for the honour of the little club. And so as County Champions and representing the Kingdom they were then invited into the Knockaderry Munster Junior “B” Championship organised by the Limerick club. This was an historic occasion; and what a moment for Asdee as they were mentioned in the same world as Dr. Crokes, Keel and Currow as representatives of the County and facing into the unknown. In the semi final they saw off Feenagh/Kilmeedy and now we are anxiously waiting the Munster Junior “B” Final which will shortly be played in Knockaderry where the Cork Champions, Charlville will be lying in wait and hopefully a victory to savour at the final whistle will crown a memorable year in the history of Asdee. And so once again we await the age old rivalry, Cork V Kerry but this time strictly for the honour of the little village in every true sense of the word. The atmosphere that night in The Listowel Arms as the players were introduced to the two hundred or so supporters as the marched up to accept their medals was simply amazing. To add to the celebrations Asdee’s 1988 County Novice winning side were also honoured and wonderfully rousing speeches by John Kennedy Dan Dalton and inspirational captain Eoin o Carroll would put the hair standing on the back of your neck. All this brought home to me in no uncertain manner that here was the true essence of the GAA. Here I witnessed the real core of the association, the heart, the soul the true meaning of what bonds little communities together and in an age of spiralling emigration, unemployment and clubs joining together Asdee stand out as the supreme example of survival. And as their exemplary chairman and secretary Padraig Vallely and Mark o Hanlon remarked to me, “most of the time Weeshie its about just surviving and keeping the club alive and its nights like this that drive us on”. Not many other clubs in this county could have over two hundred supporters sitting down together under such circumstances in this day and age and North Kerry Board Chairman Billy Enright and County Board Officer Christy Killeen also spoke of their huge admiration for the work Asdee continue to do and had special praise for one of their outstanding servants Jack Hennessey. However for me my abiding memory at the end of an unforgettable evening was the togetherness, the sheer club pride, the passion the enthusiasm and fervour which prevailed as the night unfolded. I came away saying to my self if one could capture and bottle the atmosphere which surrounds this little club Asdee, sell it around the county, one would become a rich man over night. They are a credit to the association and should stand as a shining example to many other clubs.